1. A convertible sofa perfect for when friends decided to crash at your place. Is the living room large enough to accommodate said friends? NOT REALLY, no! But at least this turns your couch into a bed with the snap of a finger. Get it from Wayfair for $252.99 (originally $479, available in three colors). 2. A mid-century sofa with a sleek, modern design that looks significantly more expensive than it is. It even comes with two decorative pillows to trick everyone into thinking you actually tried to home-ify your new place! And yep, this comes with the decorative pillows you see above! Get it from Amazon for $239.99 (available in two colors). 3. An overstuffed tufted loveseat that belongs in a home library, surrounded by volumes of literature and rare gin. Does my my high school AP English teacher own this very piece of furniture? It's highly likely. Promising review: "I was looking for something leather and comfortable to include in my library. This fits the bill perfectly. I love the fabric design on the back and the sides, and it really adds warmth to the room." —Bretton P.
Get it from Pier1 Imports for $749.95 (available in three colors). 4. An upholstered loveseat you can prop right in front of the living room TV. It'll be perfectly cozy for your weekend-long Netflix binges, but thankfully won't take up 80% of your closet-sized apartment. 5. A splurge-worthy handcrafted sofa you can customize with an ottoman or chaise and low or high arms. And in true 2019 fashion, it's also got a built-in USB charger to ensure your phone doesn't die in the middle of that Instagram scroll. It even has reversible cushions (one side is tufted and the other is solid) for when you feel like changing it up a bit, and the cushions are made from a fabric that is completely scratch- and stain-resistant. Promising review: "This is hands down the best furniture I've ever owned. You can tell how durable the fabric is and I love the versatile design." —Kira P.
Get it from Burrow for $1,595 (available in five colors). 6. A mid-century faux leather loveseat here to make you believe in L-O-V-E at first sit. I mean, sight. Dimensions: 44.8" x 29.2" x 31.2"
Get it from Amazon for $211.99 (originally $467.50). 7. A tiny cushy couch available in four neutral colors that are compatible with any color scheme. Whether your walls are blue or lime green, this sofa definitely won't clash. Get it from Hayneedle for $334.56 (available in four colors). 8. A splurge-worthy reclining sofa that (with just the push of a button) turns your afternoon cat nap into one of pure luxury. Why nap in your bed when your sofa is significantly more comfortable, am I right? Get it from West Elm for $2,399 (originally $2,998). 9. An upholstered loveseat ideal for clumsy people most likely to spill red wine on their new couch. This is made with a durable fabric that is mercifully easy to clean. Dimensions: 62.2" x 30.7" x 31.5"
Get it from Amazon for $255.99 (originally $319.99, available in two colors and two sizes). 10. A velvet sofa capable of taking any boring old living space and turn it into something far more glamorous. Velvet? In furniture form? Fit for royalty. Get it from Urban Outfitters for $499 (available in five colors). 11. A rolled arm sofa that screams "COME HERE AND SNUGGLE" after a long and crappy day. Grab a book, a cup of tea, your favorite blanket, and head over to your couch for ultimate coziness. Get it from Amazon for $655.62 (available in four sizes and styles). 12. 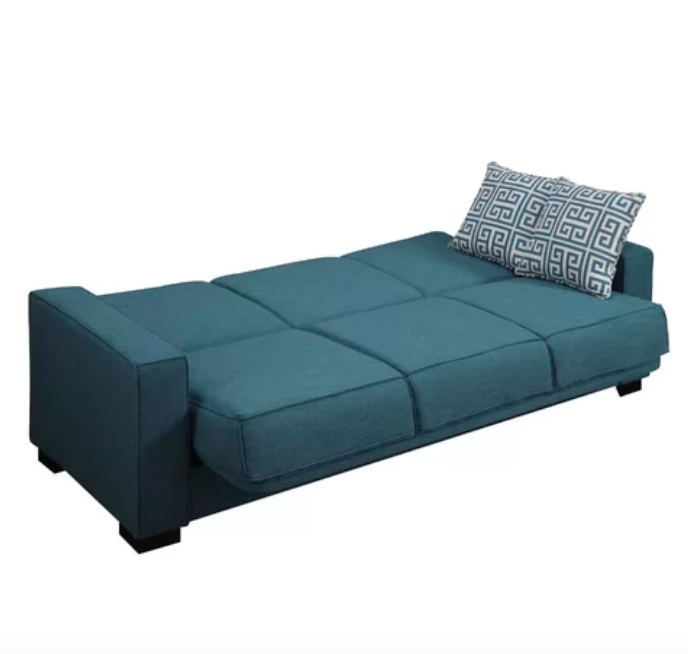 A sleeper sofa you can easily adjust into a bed for visiting family members who have decided to stay over next month. Will they hog the bathroom? Yes! But at least you won't have to share your bed, too. Psst, this comes with two throw pillows! 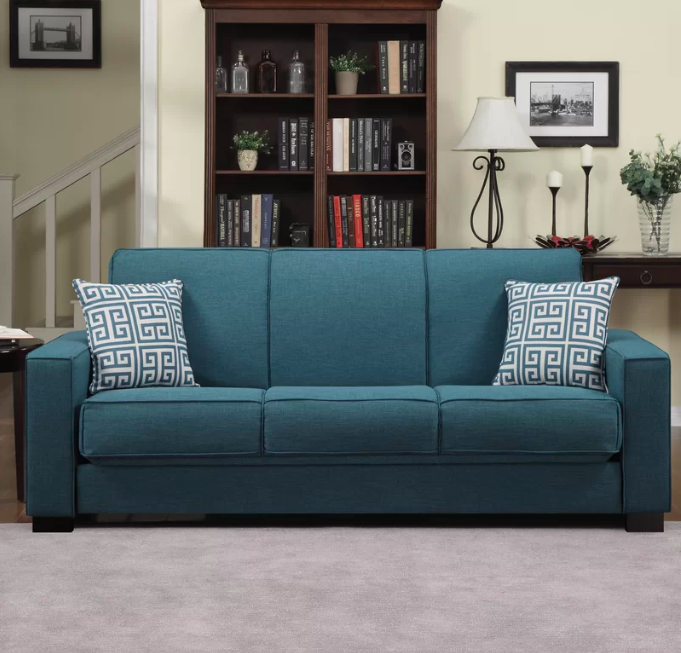 Get it from Wayfair for $483.99 (available in eight colors). 13. A down-filled sofa available in 66 (!!!!) colors, meaning you'll be able to purchase the perfect hue for you — whether that's feather gray or horseradish yellow. Get it from West Elm for $1,199+ (originally $1,499+, available in 66 colors). 14. A leather loveseat perfect for any home office in need of some sprucing up. Computer desks are neat, but nothing screams professional quite like a sofa in your personal workspace can. Get it from Hayneedle for $469.99 (originally $614.99). 15. A rolled arm chaise that makes the word "regal" immediately come to mind. Owning this beauty basically secures your spot in the British royal family. Get it from Target for $600.79 (originally $750.99, available in two colors). 16. A leather loveseat complete with removable cushions and cherry-finished legs that looks like something an adult would buy. Which is what you are! An adult! Something about a leather sofa makes me think "successful young professional with an understanding of health insurance and the tax system" and I don't why. Get it from Hayneedle for $289.23 (originally $319.94). 17. A tufted sofa you shouldn't purchase if you're prone to laziness. This comfy sofa will only worsen your mindless Instagram strolling and online shopping habits — you'll feel way too cozy to get up and be productive. Get it from Target for $479.99 (available in three colors). 18. A modular floor sofa you can customize to fit any nook and cranny in your home. And the best part? No assembly or tools required! Praise be. Get it from Urban Outfitters for $179+ (available in two sizes). 19. A chesterfield loveseat available in a gorgeous yellow hue. This is ideal for pads with an maybe one window and no natural light — at least this will add some sun to your living space! Get it from Joss & Main for $329.99 (originally $499.99, available in nine colors). 20. A track arm sofa so cozy, your social life will probably suffer. Why go out on a Saturday night when you can bond with your furniture? It just doesn't make sense to leave. Get it from Hayneedle for $266.92 (available in four colors). Want more furniture inspo? Check out the best places to buy a sofa online!